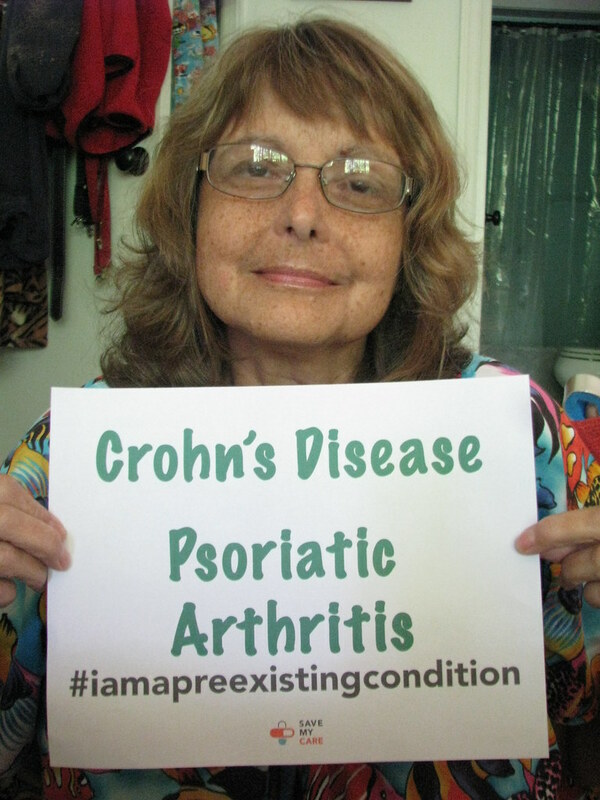 I have psoriatic arthritis and Crohn&apos;s disease. My husband, 12 years older, is retired and I am unable to work because of my chronic illnesses. I am insured through the ACA marketplace. If I lose this insurance, either because the state waives the pre-existing conditions requirement or because the premiums become unaffordable on our limited, fixed income, the medications that keep me out of the hospital and functioning in the world will be out of reach for us. Without medication, I will be wiped out by the fatigue that accompanies both illnesses. I will have severe joint pain limiting everything I want to do – even walking around the house. Snf I will have frequent bowel obstructions sending me to the hospital for stays of at least several days. On a daily basis, I will have severe GI distress with pain and cramping. I know this because I&apos;ve been through it before we found a medication that works decently – and I still have occasional days like this. And without insurance, one day I will be trying to wait out an obstruction rather than incur another unpayable hospital bill and I will end up dying from a perforated bowe. While I don&apos;t have cancer, the ACA is truly about saving my life. Let me tell you about my patient Kyle (not his real name). He is 43 and lives in a rural town 2 counties away from here. He is trained as a mechanic and for years maintained a steady job, which also provided him health insurance. Eleven years ago, Kyle severely injured his back at work. For red-tape reasons, he was unable to obtain workers’ compensation, and had to quit his job. His pain was so severe, even minor daily activities were excruciating. He obtained federal disability insurance, but what he wanted most was to go back to work. During the next year or two, Kyle underwent a number of surgeries—two on his back, and two on his umbilical hernia which needed repair. The surgeries were disastrous. Not only did his back surgeries worsen his pain, his hernia repair failed. So, eight years ago, Kyle now had both severe back pain, as well as hernia pain. Positions which made his back pain better worsened his hernia pain—and vice versa. Kyle worked very hard in physical therapy to at least make his back pain tolerable enough to return to work. He still had severe hernia pain with certain movements which he stoically endured. He was rehired as a mechanic seven years ago. He did well for two years. He was a hard worker and a faithful employee. He never missed work regardless of severe hernia pain and frequent back pain. One day at the car shop, a fellow worker became enraged at Kyle. The origin of the incident is in dispute, but the co-worker tackled Kyle, who’s back slammed against a large tool box. Both workers were immediately fired. And both lost health insurance. Needless to say, Kyle’s back pain returned—with a vengeance. Yet at this point, no surgeon would touch his back. His general surgeon said there was nothing he could do for the failed hernia repair. Even if the doctors could help him, Kyle did not have health insurance. Although he had been on federal disability, getting it again could take years. Thus he could not have afforded surgery anyway. He could not even afford to go to a pain doctor. Since Kyle had income for the first half of that year, he did not qualify for Medicaid. He knew a friend who is a patient of mine who referred him to my clinic. Kyle and I explored many options to get him free care, but what he really needed was back surgery by a skilled spine specialist. Politically, Kyle leaned Republican, and was a staunch opponent of Obamacare. The only option we could find to get him covered, however, was “Obummercare” as he originally called it. “I am not one who wants to take free stuff, Dr. Spangler. What I really want to do is get back to work,” he told me at his first visit. Still, he did sign up for the Obamacare. Magically, his home-county surgeons and pain specialists would now see him, and we immediately set up timely appointments. I phoned him and told him to dial 911. Typically stoic, however, Kyle instead drove himself 30 minutes to our hospital. His heart was in the throes of an attack. He was rushed to the cardiac cath lab which confirmed four blockages. The one causing his current symptoms was on the front of his heart—the so-called widow maker. He was immediately taken to the operating room and underwent coronary artery bypass grafting to those four arteries. Due to his prior illnesses and limited mobility, he had a very rocky post-op course. During his prolonged ICU stay, it was touch and go for several days. Kyle’s total hospital bill was in excess of $100,000. This would have been completely his responsibility had he not enrolled in Obamacare. The week before. Kyle tells me “Obummercare” saved his life. Not only did it pay his hospital bills. It also helped him buy expensive prescriptions crucial to prevent recurrent blockages. He is getting better. He had back surgery here and a long course of physical therapy—both covered by Obamacare. He is on non-addictive pain medications. He still has hernia pain which is manageable because his back pain is so much better. He has right leg weakness, and often trips when he walks. Kyle’s home county voted overwhelming for Donald Trump. I don’t know who Kyle voted for in November, and haven’t asked. But I do know that he feels indebted to Obamacare. He has reason to be concerned. Both the House and Senate healthcare bills replacing Obamacare make major cuts to Medicaid—a program that Kyle might need in the future. Both bills exclude a set of minimum benefits (preventive medical care) which Kyle definitely will need in the future. If Kyle loses Obamacare and does not qualify for Medicaid, it is entirely possible that he will not be able to afford ANY type of insurance. But, guess what? If his insurance lapses for 63 days, the Senate bill will not allow him to buy insurance for 6 months. Kyle could face major health care costs over 6 months if his heart gets worse. Furthermore, the House bill allows states to do away with protection against preexisting conditions. Do any of us have confidence that our state, North Carolina, will continue such protection? Will Kyle face steep insurance costs because of his prior heart attack? The American Medical Association, the AARP, the American Hospital Association—among many other health care organizations—strongly oppose the House and Senate healthcare bills. My medical society, the NC Academy of Family Physicians, also opposes these bills. Indeed, the NCAFP has urged us family docs to speak out against these pieces of legislation—which is why I am writing today. We need Senators Burr and Tillis to vote against this legislation. When Kyle signed up for Obummercare, he was so glad he did. But now, he’s worried about an even bigger bummer called Trumpcare. Will it also be called Burrcare or Tilliscare? Meet Lydia (and her twin sister Carol). Meet Carol (and her twin, Lydia). Carol was born 3 months premature and weighed only 2 lbs. 5 oz. at birth. In addition to the many problems faced by micro-preemies (including necrotizing enterocolitis (NEC) like her twin sister Lydia), she was also born with congenital heart defects. Meet Aadi. Aadi was born 2 months premature with cerebral palsy. He had a life and death situation during birth. by 2020 – more than our income! All of our living expenses will have to be drawn from our retirement investments. We are fortunate to have those funds, but they too are limited. By the time I qualify for Medicare, our retirement funds and those of my siblings will be markedly reduced, even with us cutting other costs as much as we can. I&apos;m lucky to have resources and to have a husband and siblings who are willing to do whatever is necessary to get care for me, but I will be faced with the decision to bankrupt the people who love me or go without treatment. If I have to return to the levels of pain and GI distress I&apos;ve known in the past, suicide is the only answer even though it would deeply hurt those who love me. I just can&apos;t go through that again.